If confirmed, King will run the huge federal agency that drafts, writes, and enforces the myriad regulations that shape day-to-day education in the United States. That makes him far more important than congressional legislators, who have little practical ability to set or correct federal education rules. King is the former Commissioner of Education in New York State whose tenure there was characterized by his avid promotion of the Common Core standards initiative and his disdain for its opponents. There is little reason to be optimistic about King. In New York, he embraced Common Core and pressed ahead with its implementation despite a disastrous rollout. When a stop on a statewide speaking tour included harsh criticisms of Common Core, he simply cancelled later stops. Opponents likened his dismissive attitude towards critics to that of former Education Secretary Arne Duncan. President Obama planned not to nominate him for the job at all when Duncan announced his resignation, instead skipping the confirmation process by leaving King in an acting role. The Senate committee that oversees education voted to advance King’s nomination by a vote of 16-6. Led by Sen. Lamar Alexander, the committee passed through Congress the new massive education bill called the Every Student Succeeds Act (ESSA), which Alexander claims has gotten rid of federally mandated Common Core in public schools. President Barack Obama nominated King in the wake of Duncan’s departure. King has served as Acting Secretary since the start of the year, and, as secretary of the education department, would oversee the rule-making process for ESSA, which is slated to go fully into effect in the 2017-2018 school year. In fact, the Justice Department just announced this week that it will be policing schoolyards to “combat religious discrimination in schools and other educational settings” for signs of “discrimination” and “bullying,” particularly toward Muslim students. The U.S. Department of Education is one that exemplifies the vast expanse of the administrative state in the federal government. In this case, the administrative state consists of unelected bureaucrats who will actually be setting the rules and regulations with which America’s students, teachers, and school districts will be required to comply in their public schools and – even in some cases – private schools. The Education Department is wasting no time in getting started on the regulatory process. In late December, it outlined some steps for transitioning to the new law from the previous version of the ESEA, the widely criticized No Child Left Behind Act, as well as from the Obama administration’s NCLB waivers. King is one of Common Core’s staunchest advocates and a firm believer in the power of educational bureaucracy. During his time as New York’s Education Commissioner from 2011 to 2014, King repeatedly shut down important political discourse, particularly involving the discussion of whether New York should adopt Common Core. He canceled town hall meetings, limited comment time for parents and educators, and called concerned protestors “brainwashed.” Despite his efforts, opposition to Common Core remained strong. Nearly a quarter of a million public school students refused to take Common Core tests, and New York became a scene of the largest “opt-out movement” in the country. 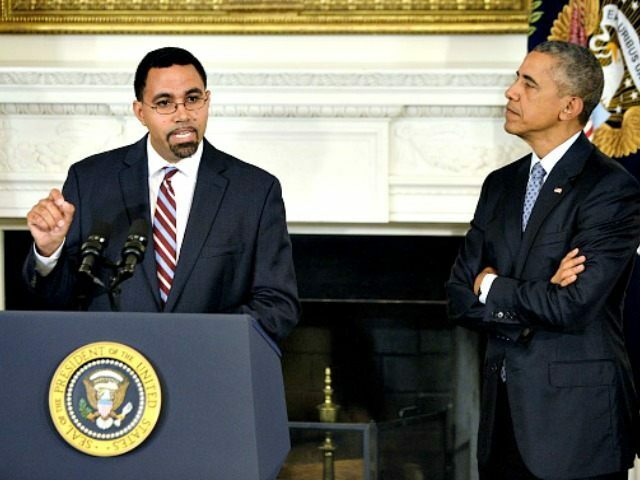 Promoting King to U.S. Secretary of Education will have a negative effect on the progress states have made away from Common Core since Arne Duncan’s resignation. An outspoken proponent of student data tracking, King is known for his support of failed data hubs (such as inBloom) which compromise the safety and privacy of personal student information. Parents and educators should be concerned for his possible data-tracking policies at a national level. Informed parents and teachers inside and outside of New York know King for his tyrannical support of the Common Core racket. In 2013, facing a grass-roots revolt across party lines, he cancelled a series of public forums on the national standards crafted behind closed doors by D.C. lobbyists, Big Business, and front groups. King sneered at parents and teachers who attended his Common Core dog-and-pony show as “special interests.” After droning on uninterrupted for an hour and a half, King finally allowed two-minute statements from the audience. Parents balked at their kids being used as “guinea pigs” for untested teaching methods; educators challenged Common Core’s assessment-obsessed, one-size-fits-all approach. King petulantly cut off testimony only 20 minutes into the feedback session to filibuster and grandstand — and then proceeded to cancel future forums. “Stopping Fed Ed starts with ridding the D.C. bureaucracy of its most hostile, unaccountable overlords,” Malkin said.